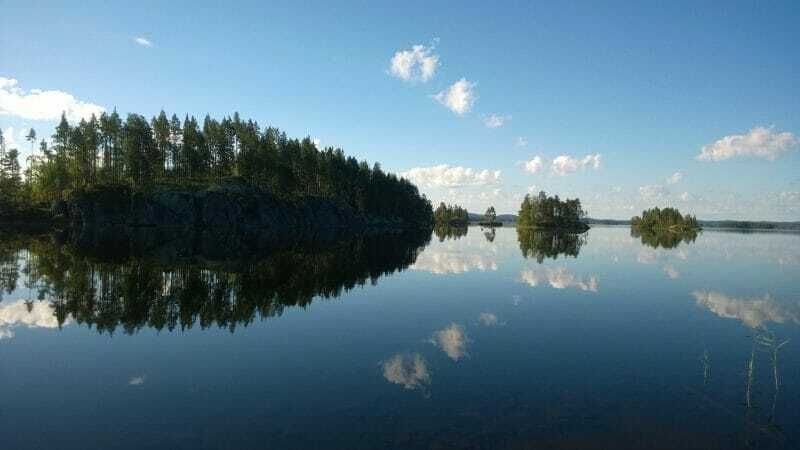 Southern Konneveden National Park is one of Finland’s most recently founded national parks, located in the heart of Finland, between Central Finland and North Savonia regions, and is easily accessible. The Fishing & Hiking program offers the traveler a variety of adventures in the national park and a possibility to explore its many faces and adore its nature. 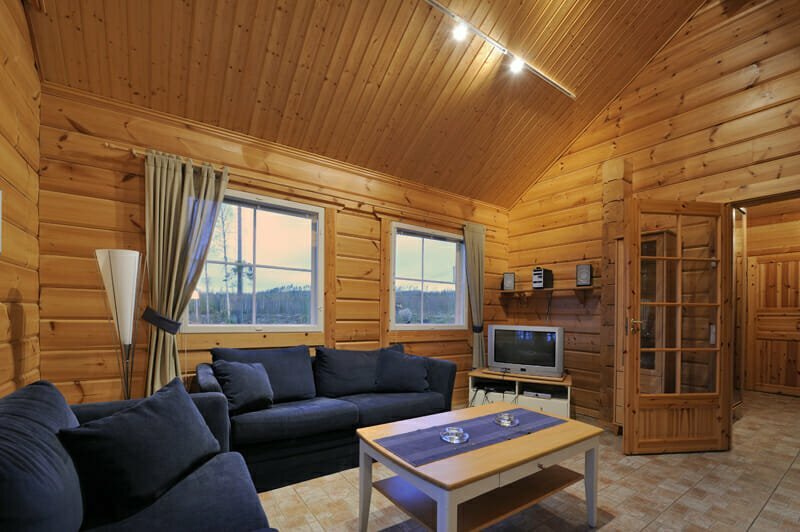 In Southern Konnevesi one can enjoy the complete silence and forget about the hectic city life. Through the forests and waterways of the National Park the visitor can search for its mysterious rulers – the osprey and the wild brown trout. 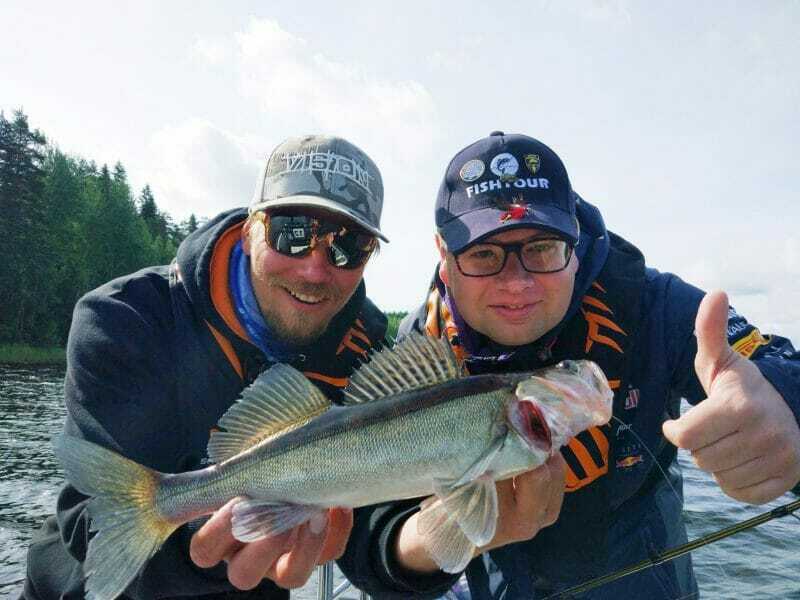 One full day of the programme is spent by fishing in the crystal-clear and rich-in-fish waters of the National Park under the guidance of professional fishing guides. The second day is spent hiking and paddling. 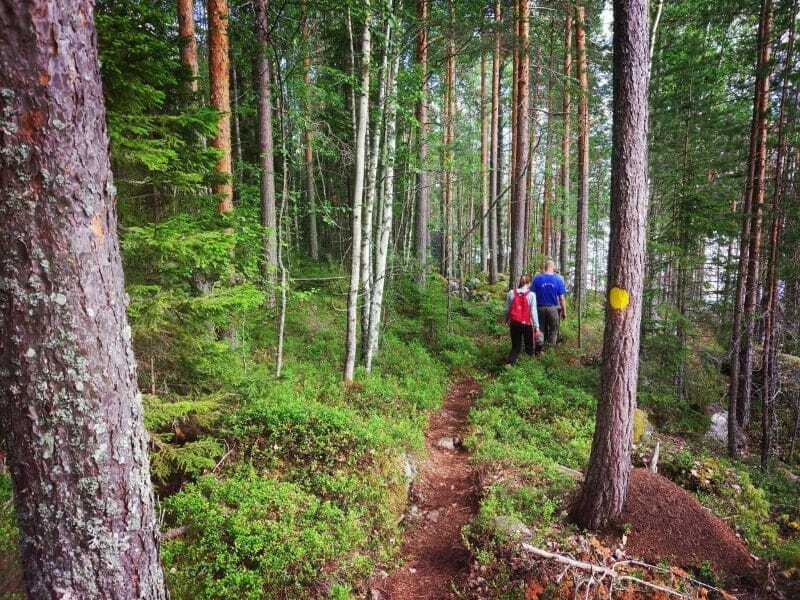 During the trip, you will be acquainted with the major sights of the South Konnevesi National Park, including the Toussunlinna ancient rock paintings, Konnekoski Rapid and Kalajanvuori Mountain. You will taste luxurious local delicacies – clean, healthy, and served in combination with stories. The program is suitable for active holidaymakers and nature lovers who travel with family, friends or small work community. All activities support the principles of responsible and sustainable nature tourism. 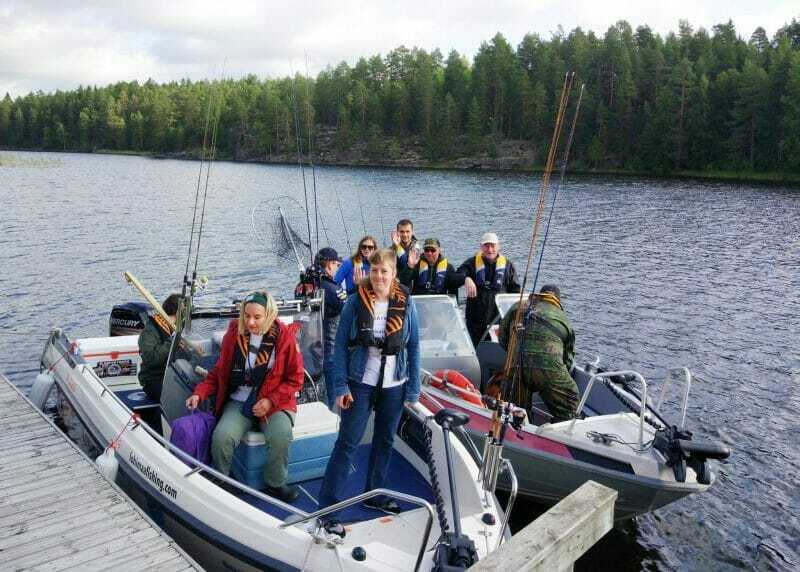 8:30-9:00 Introduction to Hankavesi Lake and Southern Konnevesi National Park. Safety instructions. 20:00-20:30 Equipment disposal. Summery of the fishing day and feedback. The unique nature of Southern Konnevesi National Park, its tranquility, the delicious picnic lunch enjoyed at open fire and learning new skills create an experience, which is sure to stay with the participants long after they return home. On this excursion you get to see the magnificent view from the top of Kalaja Mountain, learn to paddle with kayaks and enjoy local delicacies at a cosy campfire. The guide of KalajaRetkeily greets the group at Kalaja parking area. From there the group walks 0.9 km along a forest path to the Kalaja campfire shelter. From the campfire shelter a hiking tour starts to Kalaja Mountain (3 km), after which the participants learn how to paddle with kayaks on the Kalaja pond and how to make an open fire. After the activities all gather up at the campfire shelter to enjoy a delicious picnic lunch made of local products. For dessert the group will make crepes at the fire. All the foods are lactose-free. Gluten-free or vegetarian diet must be noted during the booking of the service. 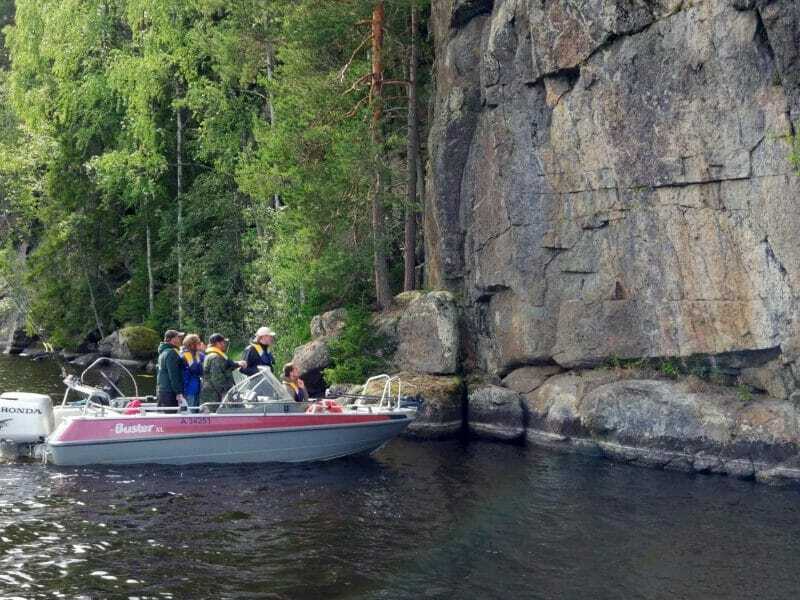 The design of the excursion has taken the safety concerns into consideration and its execution follows the safety plan and the laws and regulations of the tourism industry in Finland. KalajaRetkeily company has liability insurance from OP Financial Group. Participation requires normal physical health. The walk to the campfire shelter is 0.9km /direction along a forest path. The hiking tour to Kalaja Mountain is 3 km and the terrain is demanding due to steep rises, uphill and downhill slopes. 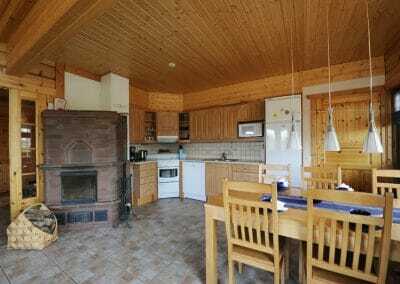 It is also possible to make shorter and less demanding hiking tour. The paddling is easy and suitable for everyone. 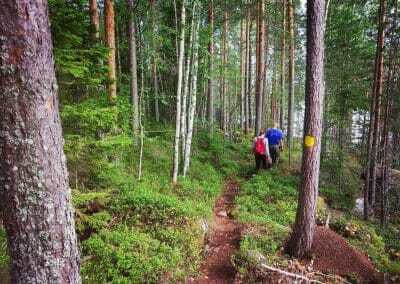 The participants are required to have clothes suitable for the weather and sturdy shoes suitable for walking at forest paths. 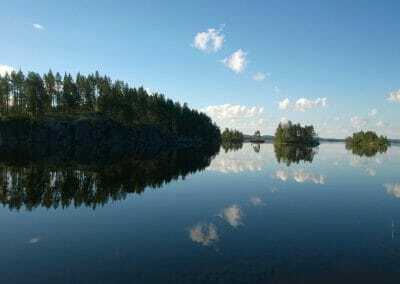 Restaurant Hetki has crafted with expertise the Rautalampi Menu as a piece of local food culture, so that the visitor can see the crystal-clear lakes, grain fields and lush forests on a plate. The products chosen for the menu reflect a wide range of nature and raw materials typical for this area. Most of the raw materials are produced or picked close-by. 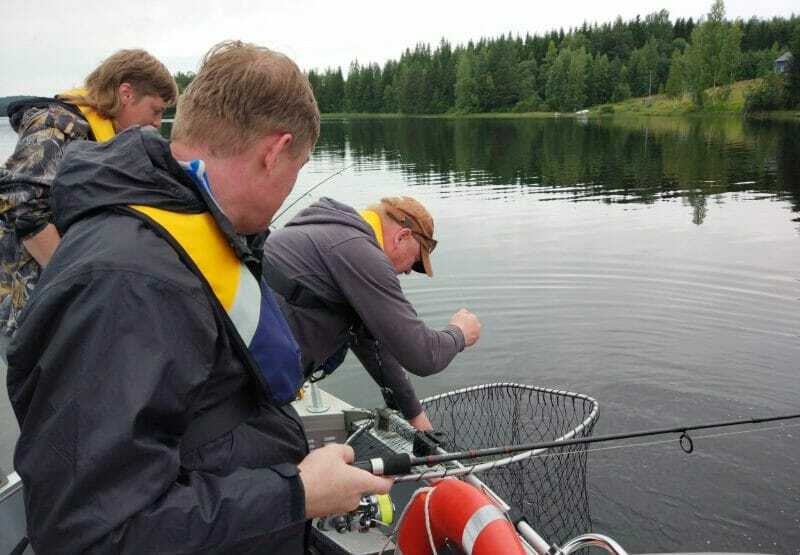 For example, restaurant owners are personally acquainted with the fisherman providing vendace for the menu, the chef himself has been collecting the blueberries for the dessert, the meat is from a farm only 20 km away. Since the restaurant knows where the raw materials come from, it can guarantee their quality. 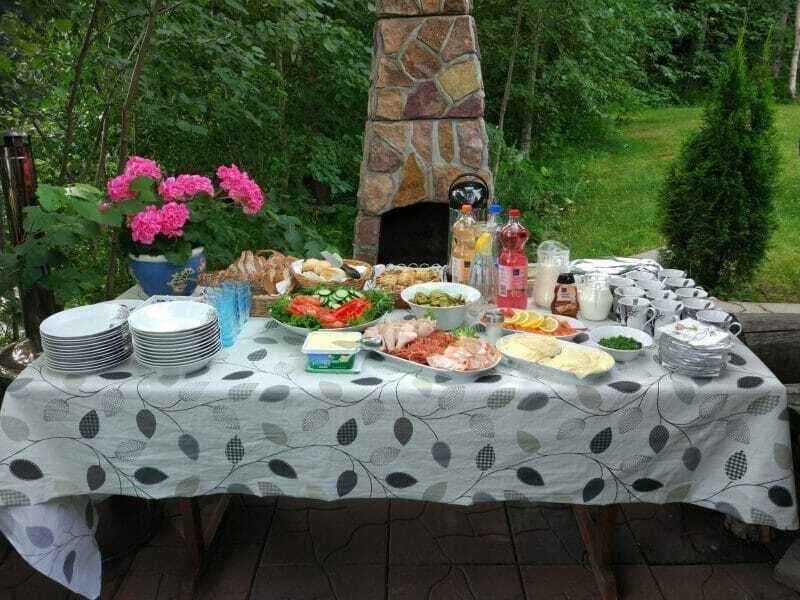 The values of Ravintola Hetki are local food, organics and respect for traditions. Accommodation: cottage accommodation for 4/8 persons (double bedrooms), kitchen (dishes for 10 persons, ceramic electric stove, extractor hood and mechanical ventilation, fridge, microwave, dishwasher, coffee maker, electric kettle, toaster), entertainment (satelite channels, 2x TV, 2x DVD players, WLAN), electric heating, floor heating, two showers, WC, sauna for 6 persons, brick tiled fire place, washing machine, drying cabinet, outdoor terrace, balcony upstairs, gas grill, terrace furniture, rowing boat + life vests, car heating plug, Nordic walking poles. Bed linen ready for use. 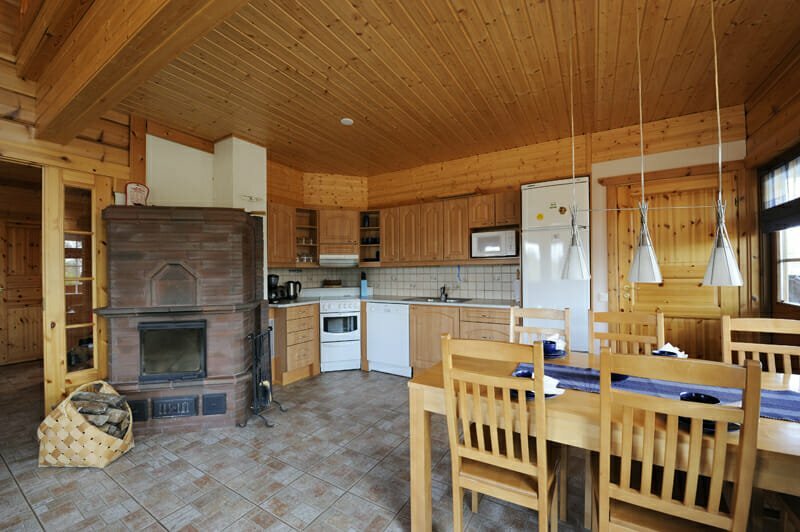 Final cleaning of the cottage. Fishing: Guidance (5h jig fishing for 4h fishing). Jig fishing: boat / two boats and guide / 2 guides, complete fishing gear, life jackets, accessories, fishing licenses, insurance, snack, beverage, transportation. Rapid fishing: guide / 2 guides, complete fishing gear, wading clothes, wading boots, insurance and permits, transportation. Little snack and drink. Lunch at the shelter on fishing day: Ccold-smoked salmon soup (local salmon), rye bread from Mannisen home bakery, self-baked potato buns, spread, salad, water / juice / mineral water. Dessert: blueberry pie, vanilla sauce, coffee / tea. National Park Excursion: Guidance, all equipment needed for the program, incl. 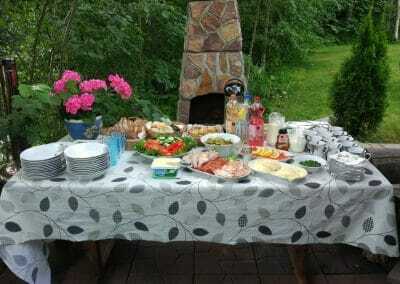 for paddling, plenty of snacks: local grill sausage, sandwich, local cold salmon, ham, spread, campfire coffee / tea / juice, fire-baked crepes with local jam. Gourmet dinner: Appetizer, main course, dessert all made from local produce. Non-alcoholic drinks, coffee. Food presentation and stories. All mentioned services in Finnish or English.